Kanye West interrupted his show on Thursday night for at least 15 minutes to reveal that he didn't vote, but if he had, he would have checked the box for Donald Trump. The crowd attending the concert at the SAP Center in San Jose, California, gave him a mix of boos and cheers, video shared on social media showed. Some even threw their shoes at the super star. A man whose Twitter handle is @RaptorJessus documented the evening heavily. "I told you all I didn't vote right? ... But if I were to have voted, I would have voted for Trump," Kanye said, adding at some point, "the internet is going to take this out of context." Like Trump before him, West has been talking about a shift from the world of entertainment to politics. But what made the singer's vocal support for Trump pretty surprising is that West has previously said that he would run in 2020, but as a Democrat. His wife, Kim Kardashian West is a big Hillary Clinton supporter. She posted a selfie with Clinton on Twitter in 2015 with the hashtag #HillaryforPresident — Kanye West was also in the picture. In 2012, West donated $1,000 to Barack Obama's campaign and also reportedly contributed to the Democratic National Committee. 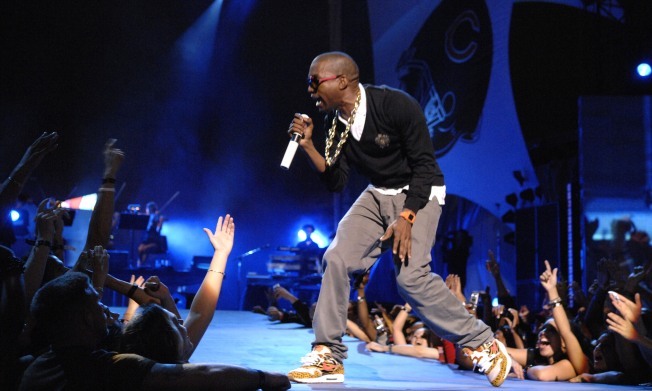 Why West was jumping in to support a Republican was not addressed at the concert. What West did talk about, for at least a little bit, was being a black man who supported Trump and racism in the United States. According to @RaptorJesuss. West said that as a black man and as a celebrity, he felt persecuted for supporting Trump. Now, that Trump won, West said he feels vindicated. And West said that he believed that neither Clinton nor Trump would end racism. "[Voting for Trump] don't mean that I don't think that black lives matter, that don't mean I don't believe in women's rights, that don't mean that I don't believe in gay marriage," West said. But then he also urged the audience to "stop focusing on racism" because "we're a racist f***ing country — period." He said that "not one or the other candidate was going to instantly be able to change that." Many who attended said in interviews later that they didn't appreciate the political diatribe, when they paid to hear music. After the concert, David Murray of San Jose said: "People came to listen to music. I came to hear a concert, I didn't come to hear politics. I think he talked a little too much." Another man leaving the concert shouted out, "Next time you're going to rant, do it on your own time." But others felt differently, saying that West's star power means he can use it as he wishes. AJ, a 20-something man from Hayward, said West had every right to express himself, and he respects that. Paul of Fremont added: "He said what he had to say, and he used his platform to tell everyone how he felt." Roni of Palo Alto, who also didn't give her last name, said she was all for people speaking their minds, but that West's "banter about politics didn't make any sense." Before he stopped live-tweeting at the concert, @RaptorJessus summed up the experience with a prescient thought: "Kanye said some crazy s---. People are upset and rightfully so. I'm sure this will be all over the news tomorrow." Kanye is now saying how he loved Trumps debate style. Kanye is glad Trump inspired racists to reveal themselves. "This is the beginning"
Kanyes gotten through 5 songs in a row, he just stopped again, Kanye says "I wanted to vote for Trump", says he respects Hillary supporters.